Many people may not be aware that you can sew leather garments at home, just like regular fabrics. This is because many sewing machines do not support good quality leather stitching. However, due to increasing demand from users, manufacturers have started producing modern sewing machines that can handle leather projects with ease. Unlike regular cloth, leather is a much thicker and sturdier fabric. You need specialized needles, a different presser foot, and nylon or polyester threads for leather stitching. You also need a sewing machine that is capable of stitching leather. 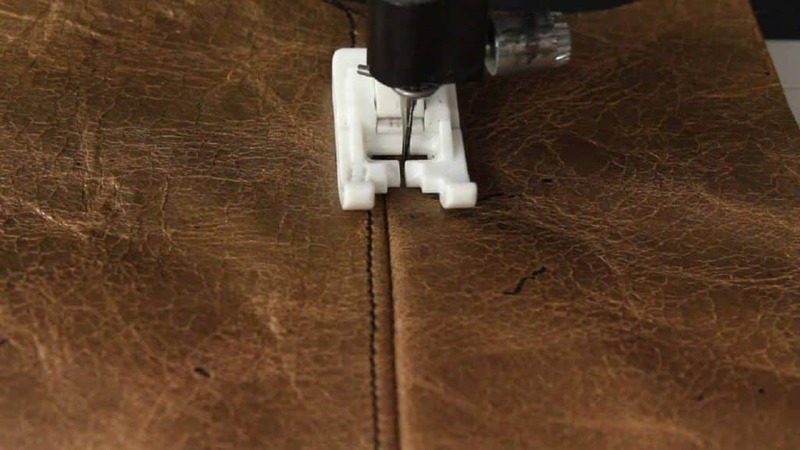 In this blog, we cover some tips for sewing leather projects and go over some of the best sewing machines for leather available in the market. Sewing leather fabric together is easier than you might think. All you need to do is make a few adjustments to your sewing machine and pick the right material. Once you get the hang of things, projects will flow magnificently. The regular presser foot used for cotton stitching can stick to the leather, making it difficult to flow through the material smoothly. Sewing machines with leather handling come with specialized presser feet that easily glide over the material, giving you an easier stitching experience. There are a few options you can try. First, there is the roller foot that has one to three small rollers that control the movement of the leather and guide it under the foot easily. Another option is a coated foot that is coated with Teflon, faux leather or similar textile that allows leather to glide under the foot easily. The third option is the walking foot that has its own feed dogs that work in tandem with the machine’s feed dogs. The walking foot grips the leather from both sides and feeds it through the machine evenly allowing for smooth stitching. The regular sewing needle is built for finer materials like linen and chiffon. It does not work too well on thick material like leather. If you are planning to work on leather, make sure you switch to a heavy-duty needle with a specialized tip that can pierce through leather easily. The needle can wear out and become blunt when working with leather quickly, so you may need to change it regularly. Leather requires a different type of thread to hold it together than regular fabric. If you use regular thread, the tannins in the leather will weaken and erode the thread after a while. Polyester and nylon threads are more sturdy and good for use in leather stitching. Pins are commonly used in sewing to hold the material together and ensure that different layers remain aligned. You can’t do that for leather however as pinholes made into leather are permanent. Instead of using pins, you should use folding or binding clips that hold layers of leather together. You can also use double sided tape to hold layers together. Leather is stickier in composition compared to other fabrics and it does not feed through the machine as quickly as other materials. This happens even when you use a support foot presser. In order to keep the material from multi-stitching, the stitch length is adjusted for leather. It is usually longer than regular stitching and ranges from 3 to 4 mm. Using a shorter stitching length can cause the leather to tear up if it does not feed through the machine quickly enough. Leather is unlike other materials because once you’ve run a stitch, it punches holes in the fabric and you can’t alter it without showing the holes. This is why you should take your time on leather projects to make sure that you are 100% satisfied with the seam and know exactly where to run the needle. You can also test the performance of your machine on a test fabric to make sure that you are on the right track before starting the actual stitching project. Most sewing machines have a built-in automatic tension adjustment feature. This feature ensures that threads hold different layers of leather firmly together and threads do not show when seen from the other side. Leather projects are good because the edges do not fray and fold like lighter material. They also do not need special finishing. However, your leather projects will have a flatter finish if you topstitch them in place. You can use a hammer to reduce the height of the seams and trim them in line for better topstitched edges. To press the leather, cover it with a clean press cloth and then hammer it evenly all over the surface area. You can also smooth out the leather and remove wrinkles by pressing the leather with an iron. Place the leather on a flat surface and cover it with a press cloth. Gently iron over the cover sheet to get pressed leather material. Some of the popular and most effective sewing machines for leather include the following. This is one of the best sewing machines in the market that is designed specifically for sewing leather projects. The machine can stitch leather, denim, canvas, and other heavy-duty materials like they were cotton. You can also use the machine to stitch mats, quilts, and tie-up blankets. Products with up to six layers of cotton can be sewn together with ease. There are plenty of features in the machine including a built-in needle threader, seam guides on the needle plate, thread cutter, a dial for tension control, and speed adjuster. It comes with 18 built-in stitch styles, has a three-piece feed dog, a drop feed, and a four-step buttonhole. It has a free arm that allows versatile stitching and the reverse stitch function. The only downside is that the machine is quite heavy which makes it difficult to move around. It is great for leather, but the quality of finish on lighter fabrics is not very good. 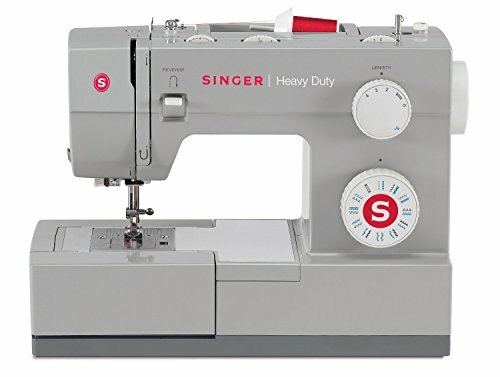 Singer’s Quantum Stylist is an amazing machine. It is great for cotton and regular material projects but also works well with leather and heavier fabrics. While the machine is not specifically designed for heavy duty work, it shows perfect handling for leather with impressively smooth finishing. The Quantum Stylist offers some of the best features for a machine that is capable of leather projects. 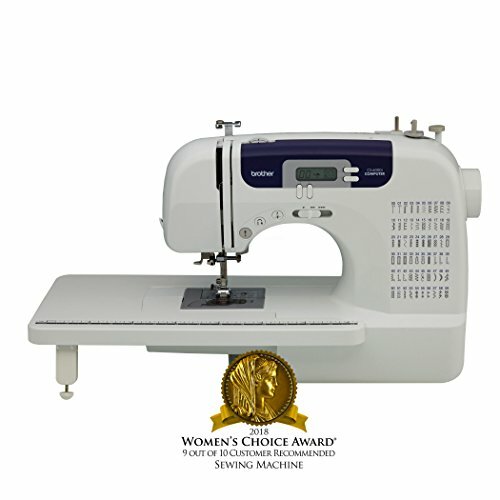 It has automatic needle threading and comes with 600 built-in stitches including 13 one-step buttonholes. It offers five different font options and even has stitch editing for regular fabric projects. All these features make it one of the most versatile machines that you can get. Further features include two LED lights near the working table, a thread cutter, bobbin winding, stitch size adjuster, and a programmable autopilot with speed control functions. The machine has an extension table and speed control lever. The downside to the machine is that it is more expensive than regular models and new users would find the features on the machine a bit overwhelming. 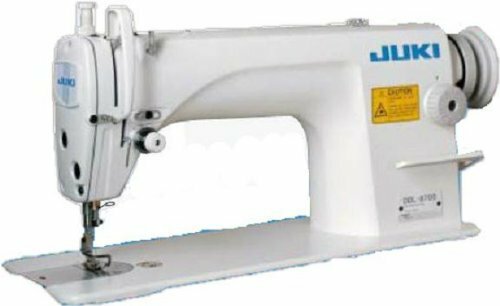 Juki DDL-8700-H Industrial Straight Stitch Sewing Machine Price: $749.00 "The machine works great and is powerful. Plus quiet with the servo motor. " This is an industrial-level sewing machine used by professional tailors and cloth makers. 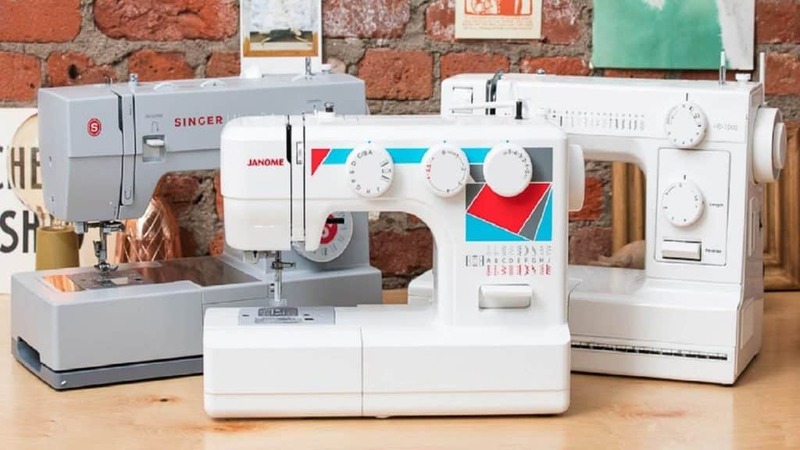 If you take on projects on a professional level and need a sewing machine that can work with different kinds of fabric, then this machine is for you. The machine is perfect for home-based professionals. It has low noise and low vibration feature that allows you to work without causing any disturbance. This Juki machine is capable of up to 5,500 stitches per minute which is much faster than its competing brands. It is made for all kinds of fabrics, from the lightest silk and cotton to the heavy duty denim and leather. You can use the machine to repair or modify any type of article of clothing. The DDL-8700 is a straight line stitching machine. The stitch length can be adjusted up to 5 mm but it does not offer many stitch styles. The distance from the neck to the needle head is 11 inches and it includes a fully assembled table and servo motor, allowing easy handling of the material. The machine is easy to maintain with its automatic lubricating foot. It is quite heavy at 61 lbs. 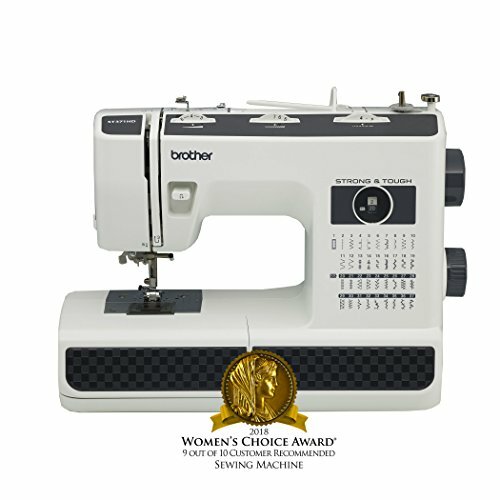 Brother ST371HD Price: $199.95 "Does a great job of sewing thicker seams that my old machine would not handle." 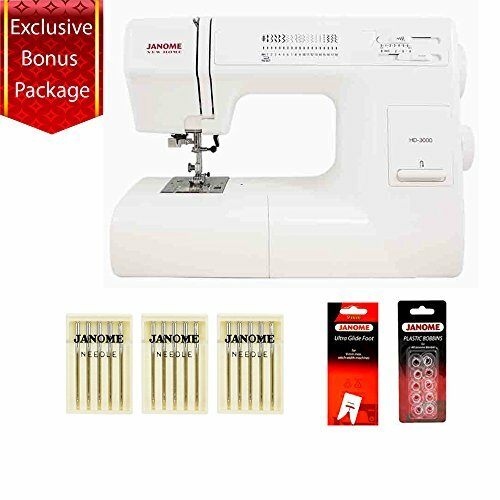 This machine is suitable for users who are looking for a low-cost option in sewing machines that can handle leather effectively. While it is not in the same league as some of the other heavy-duty industrial machines in terms of production capacity, it is a good option for home users that have to work with leather, denim, and other heavy materials regularly. The metal needle plate and foot presser ensure that leather feeds through the machine smoothly without getting rucked and crumpled. It offers 37 built-in stitches including decorative stitches and a one-step buttonhole. A single dial stitch selector and diagram makes stitch selection very easy. The model also has automatic needle threading, drop-in bobbin winding, and reverse stitching. It offers reasonably fast speed and can go up to 800 stitches per minute. It has a brightly lit working area and a free arm that offers a lot of versatility in stitching. This is a newer model from Singer that has received favorable ratings from customers and is quite popular with users. The machine is not industrial strength and not as powerful for big projects as others. However, it is excellent for intermediate users who work with canvas, denim, and leather. It comes with a metal frame and the bedplate is made with Stainless Steel. It offers speed of up to 1,100 stitches per minute which is reasonably good for leather stitching. The machine has 23 built-in stitch styles that can be adjusted with a twist knob dial that makes it very easy to change styles and patterns. It has an auto needle threader, a top drop-in bobbin, an automatic one-step buttonhole, and a leather stitch option on the machine. You can adjust the presser foot pressure to control stitching speed for light or heavy material. It also includes a reverse stitching option for reinforcing stitches. The machine is very sturdy and durable despite its light weight and small dimensions. It weighs about 16 lbs and easily portable. The CS6000i is a heavy duty sewing machine that can be used for thick material including denim, wool, canvas, and leather. It’s a strong workhorse that is also used by professional cloth makers in commercial settings. The CS6000i offers plenty of features and stitching styles that make it useful for beginner and intermediate users. It can go up to 850 stitches per minute which is reasonable for leather projects, even if it is not the fastest. The model has 60 built-in stitch patterns; a high number compared to other models that can work with leather. It includes seven one-step buttonholes and a reverse stitch lever. It also offers an automatic needle threader, easy bobbin winding, and speed control-adjuster. Having a wide work table gives it enough space and an LED light that makes it easier to focus on projects. The free arm makes it versatile enough to sew sleeves and trouser legs. The best part about the machine is that you can program the stitch length and width through the LCD screen instead of adjusting it manually each time. It also has a start/stop button at the front so that you don’t need to depend on the pedal.